Now is the Time to Update Your Business Facade! EHFNA's Business Facade Improvement Grant program was created with the idea that healthy businesses contribute to, and are part of, healthy communities. When we can do business in our neighborhood, our communities are stronger and more sustainable. When our businesses are clean and look good, we have a stronger sense of civic pride - we like our neighborhood more. Since 1991, EHFNA has improved the facades of many businesses in the neighborhood. From new awnings to fresh coats of paint, this grant program has done a lot to beautify our neighborhood, improve local businesses, and show everyone that we care about our community. Please see attached EHFNA Business Facade Matching Grant Business Guidelines for detailed information on the program. In the past year, the East Harriet Farmstead Neighborhood Association (EHFNA) has been encouraging businesses and commercial building owners to make facade improvements through a matching grant program. To encourage facade improvements that preserve and enhance the historical and urban nature of the facades of these commercial buildings, EHFNA has been utilizing the City of Minneapolis Great Streets Facade Design Guide that is part of its Great Streets Neighborhood Business District Program as our architectural guide in awarding matching grants. The program has been and continues to be successful in aiding our local businesses to make their storefronts more attractive and inviting while maintaining an urban look and appeal. As development of our business nodes continues in the future with or without the neighborhood grant program, it is crucial that the neighborhood be proactive in influencing the nature of the architecture that is in keeping with the overall character of the node and urban environment as a whole. To this end, the EHFNA Housing, Zoning and Business Committee has assembled a team to develop East Harriet Business Facade Design Guidelines pertinent to each node that build upon the City's Facade Gudelines and will inspire and give focus to business/building owners who want to maintain or build on the aesthetic quality of each business node. Here's where East Harriet residents can help! 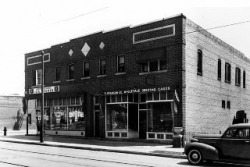 To better understand the business & architectural history of East Harriet, we are looking for photographs that illustrate East Harriet business historical architecture and types of businesses that were located in our neighborhood and in adjacent properties. Your photos and stories will help the committee piece together a historical timeline of what makes each business node unique, allowing design guidelines to be developed that blend both the past and future. If you (or someone you know) has photographs or recollections that might be helpful, please email us at info@eastharriet.org and someone from our committee will be in touch with you. Note: All photos will be handled with the greatest of care and returned to the resident. The business nodes that will be impacted by the East Harriet Business Design Guides lines include: 36th & Bryant, 43rd & Bryant, 46th & Bryant, 36th & Lyndale and 40th & Lyndale. We will keep you posted of our progress through both eNews and the Business Design Guidelines page on this website. Thanks you! Here are links to background information from the 40th & Lyndale Task Force establihed in 2006.